This West Asheville small house is on an ⅛ acre infill lot just 1 block from the Haywood Road commercial district. With only 840 square feet, space optimization is key. Each room houses multiple functions, and storage space is integrated into every possible location. 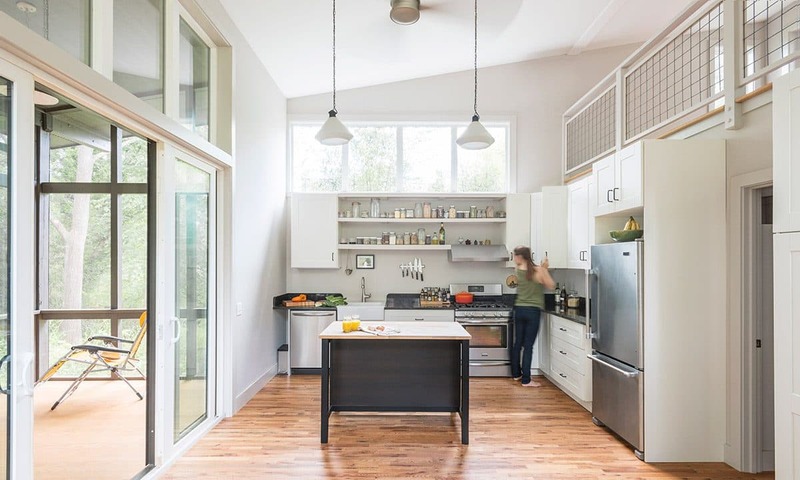 In the kitchen, simple, white cabinets completely line the kitchen/living area wall. The upstairs loft, accessed by a ladder, serves as a guest room, home office, and extra storage space. The bathroom houses a stacked washer and dryer, and an exterior door allows it to also function as a mud room. The owners strongly emphasized using available outdoor space to its fullest. 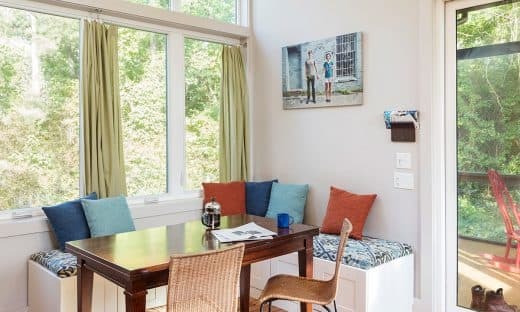 A large screened porch takes advantage of the our climate, and is an adjunct dining room and living space for three seasons of the year. 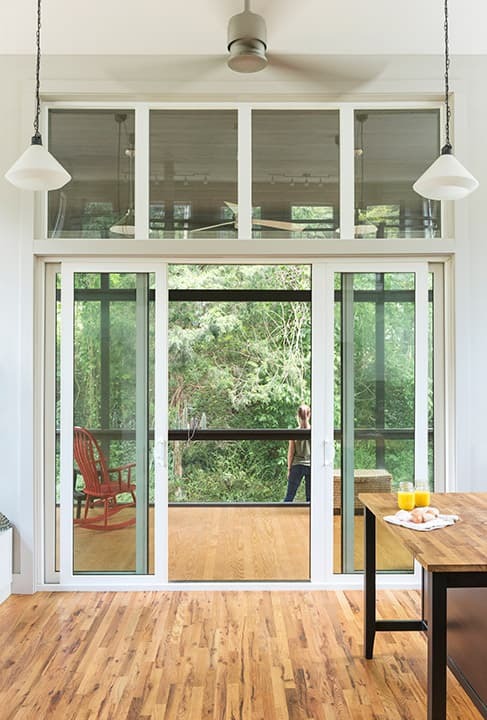 The screened porch backs up to a dense stand of trees, giving privacy to the large sliding glass doors leading from the living area. 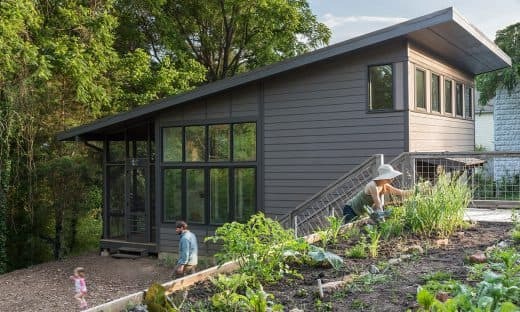 The tall east-facing wall of operable windows frames a view to the vegetable garden. A simple form and tonal grey palette unify and lend a modern aesthetic to the exterior of the small house, while light colors and high ceilings give the interior an airy feel. 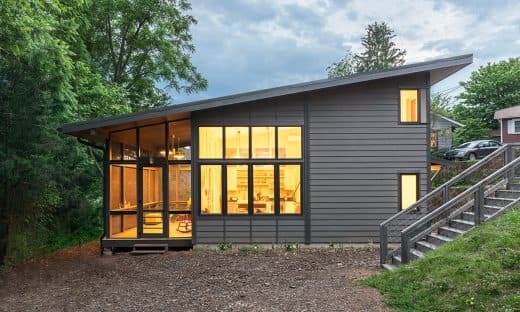 Nestled among larger, developer-designed spec houses and early 20th century cottages, this charming modern infill home is a point of architectural interest in this hip neighborhood.